← In Wenger we Trust: the rise and fall of New Labour and the road less trodden. I was struck, while watching Saturday’s football, by three particular interesting items provided by three different media sources, such is the way that information is now overloaded onto us. The first, from genuinely insightful journalist Iain Macintosh, and delivered through that most divisive of platforms, Twitter, related to Everton utility man, Phil Neville. “Controversial thought of the day – Would Arsenal have won the title with Phil Neville in their midfield? I reckon they would have done. 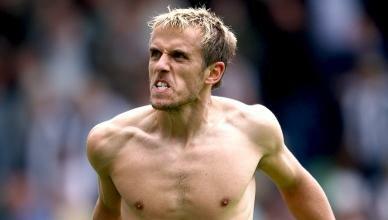 “Imagine P’Neville in place of Song/Denilson, snapping at the heels of invaders like a starved guard-dog. Crunching people with impunity. Instinctively, I was tempted to agree with hordes of angry Twitterers. How could he compare Song, in particular, with Neville? The gap in technical ability is more like a chasm. The more I thought about it, however, the more I was inclined to agree about of the merits of Phil Neville. Having built a career around making the most of the talent he has and expending an immense amount of effort and willpower, he now plays an integral role at Everton, allowing the more attack minded members of the midfield licence to push forward safe in the knowledge he will be there ready to tenaciously cut short any counter-attack that may result. More than that though. As Macintosh intimated, Neville has that mentality that will drive team-mates to work harder and let them know if they are not pulling their weight, as well as letting opponents know that his team will not be pushed around. That is a valuable commodity that can galvanise teams. “Dirk Kuyt gets his reward for persevering as he extends Liverpool’s lead”. It made me wonder how many times Dirk Kuyt and perseverance had been used in the same sentence. It must be a lot, but deservedly. Like Phil Neville, Kuyt, who although not blessed with a large amount of natural talent but has used an incredible versatility, work ethic and ability to play the percentages to be a permanent and important fixture for Liverpool. Also, like Neville, he brings a drive to his team as he plays by example, forcing his team-mates to produce the effort that he does. A writer on the Red and White Kop fan site eloquently describes him as a “platform on which to build success around, a workhorse that allows racing stallions like Suarez to thrive”. While this is very true, I think it only reveals part of the truth about the success of such grafters. They provide a great foundation for the rest of the team but also the confidence and drive that they bring to teams as well as their desire to become better players can also push them forward to be match winners themselves. Scott Parker’s (possibly in vain?) performances this season are testament to that, as is Kuyt’s 7 yard hat-trick when required by necessity to step back into his old position as a striker and his position as a stalwart in many fantasy football teams, given his impressive amount of goals and assists for a midfielder. The player that exemplifies this best for me though is Bobby Zamora. For years he was a striker who scored very few goals. Like many English forwards he sweated and toiled, provided industry and commitment but could not produce much quality when in the important areas. The transformation has been almost unbelievable. Having maintained his level of endeavour for years and continuing to learn and develop his game, Zamora is now considered a serious goal threat. He was even given his first cap for England before getting injured. Fulham boss Mark Hughes said in his post match interview on Saturday following an assist from Zamora: “I am convinced we would be in the top 10 of the table if Bobby was fit this season. “We have been involved in games where we have had too many draws. These type of players are often known as the unsung heroes of teams, which is strange given fans’ admiration of grit and determination. This, I suppose, is probably media driven, given their compulsion with stars. I do think, however, there is a growing understanding and appreciation of what the Kuyts, Nevilles and Zamoras bring to teams and their importance to producing effective units. As for whether Arsène Wenger will be adopting Iain Macintosh’s proposition on how to win the title, I am not convinced! This entry was posted in Football and tagged BBC, Kuyt, Neville, premier league, Zamora. Bookmark the permalink.